From the 1950s to the 1980s, malaria eradication campaigns dominated the international health agenda. Particularly active programmes in Latin America, South Asia, and Africa consumed a substantial proportion of national health expenditures, as well as major inputs from the World Health Organization and donor governments. Optimists argued that given enough insecticide, medicine, and money, the disease-causing mosquito could be eliminated from the planet. It gradually became apparent that the strength of the parasite to survive and continue causing disease in human hosts had been grossly underestimated and, despite some elimination successes, the programme ultimately failed. In some areas where there were significant gains, these were lost in resurgences of the disease. Lack of community involvement in campaigns, cultural and organisational inflexibility, and inadequate research support were all contributing factors in the programme’s demise. This collection of posters illustrates some of the messages that were shared during that period. 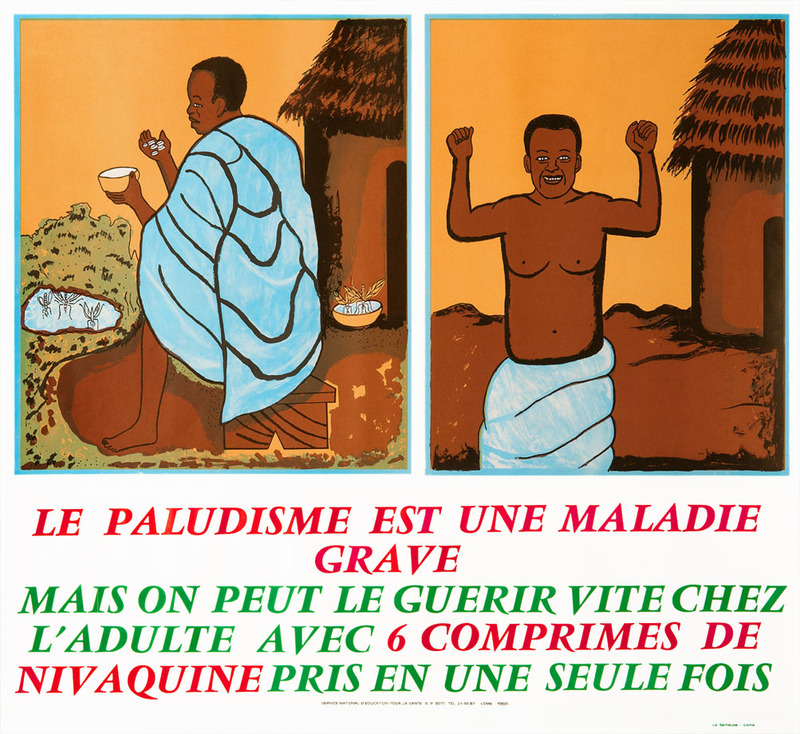 French: Malaria is a serious disease, but in adults it can be cured quickly with a dose of 6 tablets of nivaquine [chloroquine] taken in one go.